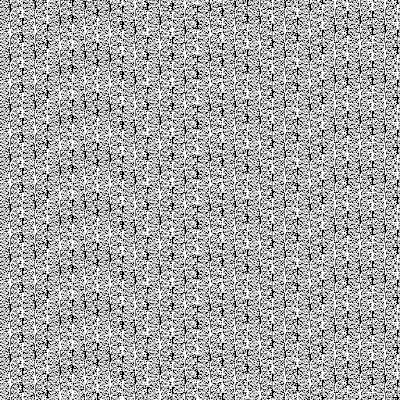 Bo Allen recently made a post regarding the difference between true random and pseudorandom numbers, using 512x512 bitmaps as illustration. Some might doubt his result on Windows, as the image seems to be too predictable. Initially, I passed it off as PHP using the default Windows pseudorandom number generator, which is a Linear Congruential Generator. Let's have a look at how PHP does rand(0,1). All code is from the php-5.2.6 source release. A bit of digging reveals that php_rand is just a wrapper to the system's random() function. Okay, so what exactly is RAND_RANGE? ﻿Wow, that is some ugly code. Python's default random generator uses Mersenne Twister, which is an excellent choice for any application outside of cryptography. Here's code that replicates Bo's experiment, including a re-implementation of php's broken rand() function. This will create three images when you run it--random_Mersenne.png, which uses Python's default random generator and randint() implementations, random_Microsoft.png, which uses the Windows LCG and Python's randint() implementation, and random_bogoRand.png, which uses the Windows LCG and PHP's randint() implementation. This doesn't look exactly like Bo's image, as I probably didn't exactly replicate all the quirks of PHP's RAND_RANGE macro. I could be using the wrong LCG as well. 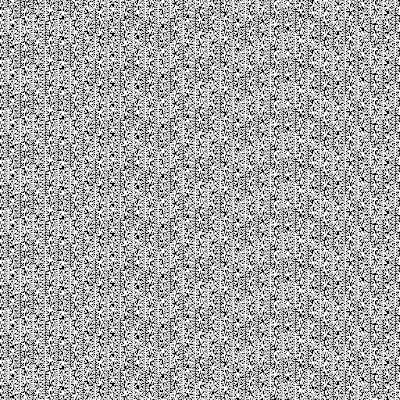 The other two images have no patterns obvious to the eye. How does Python do randint()? """Return random integer in range [a, b], including both end points. It's not that PRNGs are visibly flawed, it's that PHP has a terrible method of generating a random range. Wow, excellent follow-up! I appreciate the time you spent looking into the details of this. Using PHP's mt_rand() function (which utilizes the Mersenne Twister) provides a better random value. secondly, the RAND_RANGE define is trying to scale the generated number into the range you requested. This can result in some loss of randomness (see http://bugs.php.net/bug.php?id=45184). Python's randrange() solves this by calling _randbelow() in a loop while you're outside the requested range - which is probably the best way to do it. There is some work on this that should be coming out as of 5.3 - thanks for bringing it up! Yes, you have to use mt_rand. That's why they describe it as "Generate a better random value". That's on a linux box running php 4.4.2, the results look pretty random to me. To make the result reproducible I've seeded the PRNG with '0' using srand(0); at the beginning of the program. If you want to use the 'scale' function in PHP for something that you should be doing by a one bit and then you will reap the results of that, you are effectively sampling the lowest bit after a bunch of float operations, which is clearly sub-optimal. PHP can't correct for incorrect use. As for the rest of your code, the $x=0; line can be dropped, there is no need to 'reset' your loop variable at the end of a loop, last I checked. I'm no PHP fan but before you criticize a project make sure you understand the material. 2.) Your code is wrong. ...Pretty much just makes a black square. 3.) After fixing your code, your bitwise use of rand() on Windows actually makes an even worse random graphic. 4.) rand(0, 1) works just fine. Yes, rand() &1 is faster, but that doesn't mean rand(0, 1) is "wrong"... Especially since, in this case, rand(0, 1) produces better randomness. Your analysis is completely wrong. You forgot the ">> 16", I hope it's not intentional. But IF php were to call windows random(), there would be no problem, as anyone can see by adding back the ">> 16" that is missing. you will obtain EXACTLY what happens in Bo Allen post. I known the difference between random numbers from your blog.you also refer the logic for php for cse project centers in chennai. Nice blog! Thank you for sharing valuable information. Thanks a lot for your information. Useful post.Thank you for sharing such an important data.Keep updating for this blog. Awesome Post. Thanks for Sharing. Kepp updating. Awwsome informative blog ,Very good information thanks for sharing such wonderful blog with us ,after long time came across such knowlegeble blog. keep sharing such informative blog with us. Hi, thanks for sharing such an informative blog. I have read your blog and I gathered some needful information from your blog. Keep update your blog. Awaiting for your next update. builderall is very easy to use and cheap too. Magnificent blog!!! Thanks for your sharing… waiting for your new updates. Hello there! This is my first comment here, so I just wanted to give a quick shout out and say I genuinely enjoy reading your articles. Thanks for spending time and your effort to create such an article like this is a wonderful thing. I’ll learn many new info! Thank you for sharing this wonderful post with us. You are providing very valuable information. Looking forward to learn more from you. Great casino, ever casinos online you can safely put the top ten, with the new year already playing. At first I didn’t enter the topic as it is not hung with all sorts of bells and whistles I used to, but over time you realize that only good gaming games, bonuses and timely payments are needed in the casino, everything else interferes and distracts. Excellent post, it will be definitely helpful for many people. Keep posting more like this. There is a desire to earn a lot? Then come to us and win. top slot machine games online .Fate favors you, come in and win. This is one of the best blogs on this topic, I have more knowledge after reading you provide the great post. Great efforts put it to find the list of articles which is very useful to know, Definitely will share the same to other forums. Amazing Post. The idea you shared is very useful. Thanks for sharing. Very good information. Its very useful for me. We need learn from real time examples and for this we choose good training institute, we need to learn from experts . So we make use of demo classes . Recently we tried python demo class of Apponix Technologies. Amazing piece of work. Extra-ordinary content. It show cases your keen interest on the subject. Thanks for Posting. Excellent blog I visit this blog it's really informative. By reading your blog, I get inspired and this provides useful information.